I grew up in Whittier, California, where summers were miserably hot and smoggy. To find relief, we would drive down Beach Blvd. straight to Huntington Beach. I can vividly recall nearing the beach, catching the scent of the ocean and feeling the sea breeze:). Once in awhile we would choose instead to go to Newport Beach. For fun we would take the small ferry over to Balboa Island, known for its frozen bananas. It is said that Balboa Island was the first place to market the popular chocolate fruit on a stick back in 1953. Truth be told, I never really cared for the frozen banana, and would usually opt instead for a bagel with cream cheese...but a frozen banana cookie, now we're talking! Using a banana, make a template on heavy paper. Make your favorite sugar cookie dough. Place the template on the dough and cut around it with a sharp knife. Transfer to cookie sheet and insert cookie stick. Bake cookies and let cool. Place 2 cups of chocolate chips and 1 tablespoon shortening in a microwave safe bowl. Mix and melt until smooth. Spread the melted chocolate over the cooled cookies and top with sprinkles and nuts, or the toppings of your choice. So cool! I bet all kids love them. Mmmm yes I think I'd take your oh so cute cookie version over the real thing any time. Very true - chocolate covered banana shaped cookies sounds delicious! What a great throwback to your childhood. I'm with you on the frozen bananas. Don't like them...but these bananas are great. Such a cute idea. I love the Crab Cooker in Newport. Dopo aver visto questi biscotti mia figlia non vorrà più mangiare le solite banane ;) come darle torto! 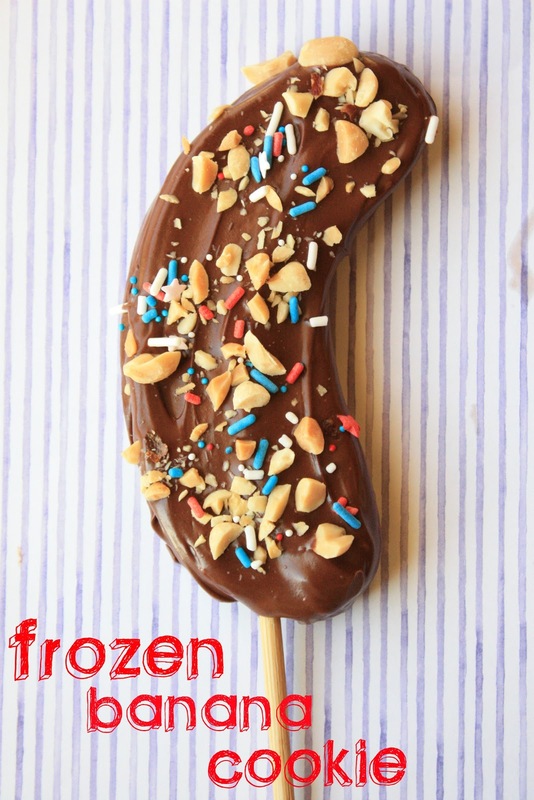 Never had a frozen banana treat but I know I would certainly enjoy these cookies! Great idea...and you can never go wrong with chocolate. P.S. My dad's family is from Whittier, CA! I have wonderful memories of staying a few weeks out of the summer with my grandparents. We also spent time at Huntington and Newport Beaches every summer! Small, small world! You are surely an expert when it comes to transforming everything delicious into cookie form :-) These are really mouth watering! Those are adorable! And, I agree that I really would rather have a bagel and cream cheese over a frozen banana. These cookies look great. And my aunt and uncle live in Whittier too! 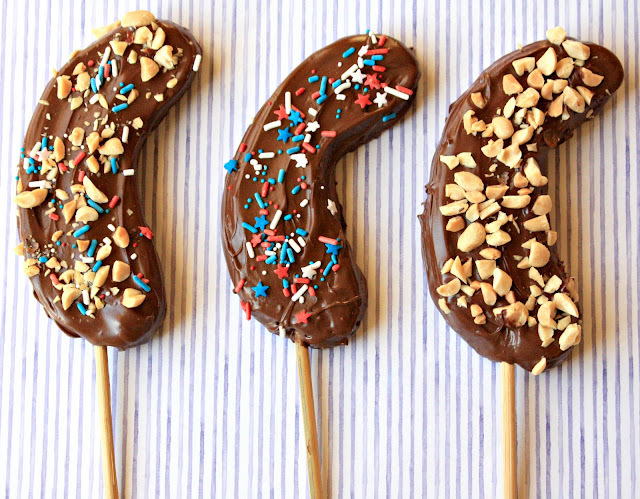 wow, so clever and looks very yum! These are just too cute! Amazing! These cookies really caught my eye! We own a beach cottage rental on Balboa Island and ever since I was a kid, have enjoyed a tradition of taking an evening walk around the Island with a frozen banana or ice cream bar in hand! Kudos for a very clever idea! I'll have to try some for our gang and bring a little Balboa to SLO County! Those look super cute! and I love anything smothered in chocolate with sprinkles...yum! I love both Huntington Beach and Newport Beach. What a fun place to grow up. I'm with you just not that crazy about the frozen banana, but these cookies I know I'd love. So clever! Sue, you make the cutest things!!! Oh my gosh!!! These are awesome! You are a cookie genius! That's simple a great idea! Another great recipe!! You are so talented. How wonderful .... love the great idea n the wonderful recipe !! I have missed visiting your blog. Those cookies are wonderful. I love seeing what you are creating in your kitchen.